For your consideration – four shows playing in the region this weekend, two that hark back to the ’60s/’70s and forward to tomorrow, plus a Shakespearean comedy and a jungle adventure. The Ko Festival of Performance opens its five-weekend season with The Radicalization Process, a multilayered piece from the The Hinterlands ensemble. 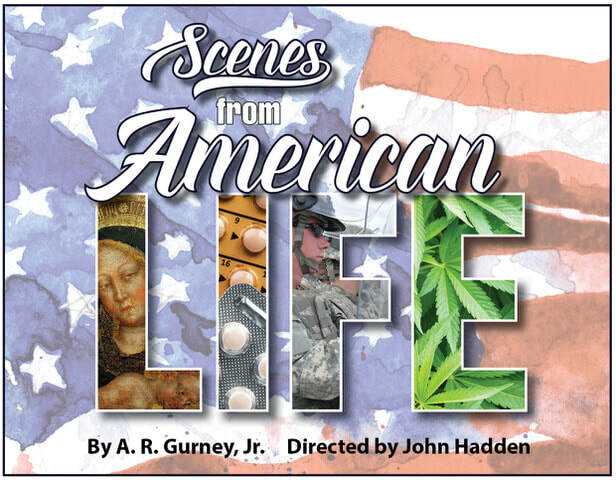 Performances are Friday to Sunday, July 6-8, in the Holden Theater on the Amherst College campus. The piece was inspired by a trove of documents discovered during the troupe’s renovation of its Detroit headquarters. It begins before the audience enters the theater, with an invitation to sift through this archive of Vietnam-era artifacts. 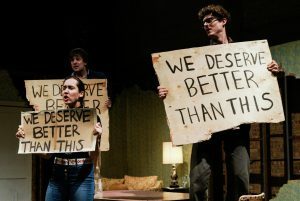 The performance proper takes place in a “safe house” in 1970s Detroit where a group of would-be revolutionaries are working to write a manifesto and construct a bomb. 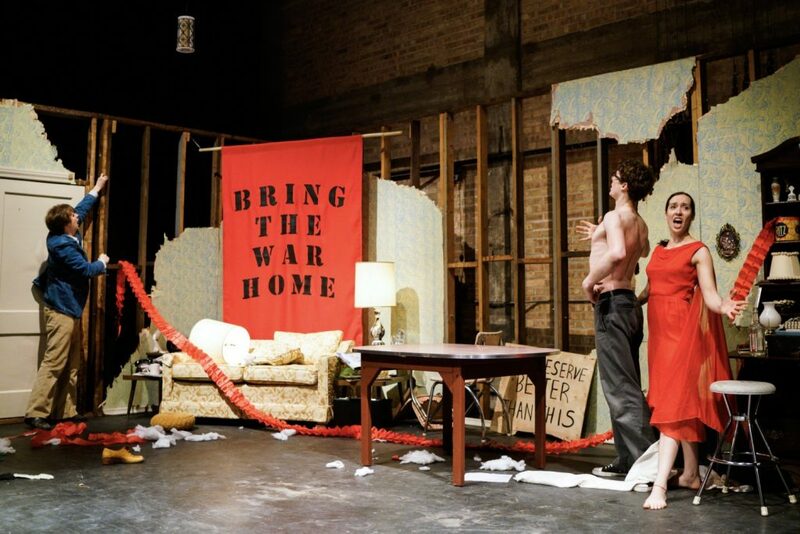 When the device explodes, the piece shatters into narrative fragments ranging from an antic parody of Method acting through revolutionary anthems and giddy dances, to a distinctly non-Orwellian vision of 1984, where Jesse Jackson is President. A.R. Gurney, “the sharp-sighted chronicler of the decline of WASP verities,” as one critic has termed him, wrote Scenes From American Life in 1969, near the start of his career. It’s a sprawling cavalcade of family histories over a 50-year period, from the cusp of the Great Depression into a future closer to Orwell’s totalitarian 1984 than Hinterlands’ hopeful satire. It’s performed this weekend and next at Vermont Academy as part of Main Street Arts’ Great River Theater Festival in Saxtons River, Vermont, the lesser-known cultural adjunct to neighboring Putney. The festival also includes a production of Peter Shaffer’s Equus and Puppet Crimes from Sandglass Theater. 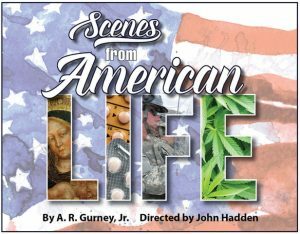 In Scenes From American Life, a cast of nine performs some 100 characters in 36 time-hopping vignettes, directed by Shakespeare & Company co-founder John Hadden. The play, Hadden says, “explores our weaknesses as nice white people, and it gets pretty harsh here and there.” The setting is Gurney’s customary milieu, the upper-crust brahmins of his native Buffalo. His themes, as Hadden lists them, are still up to date: “Racism, anti-Semitism, personal violations, open carry, the incremental drift away from democratic function, class privilege and lack thereof, all enacted around arcane social/family rituals. Hampshire Shakespeare Company, now in its 25th season, performs outdoors on the greensward of the Renaissance Center at UMass. Each season they mount two plays, with a third production of one of them performed by a youth ensemble. First up this year, playing through Sunday the 8th, is Twelfth Night, directed by Hannah Simms, who will also helm the Young Company version in August. She has staged it in modern dress with an eclectic pop soundtrack (the music that lovesick Orsino calls “the food of love” is “You Were On My Mind”). PaintBox Theatre kicks off its 15th season of twisted takes on treasured tales for kids by correcting the record on the fabled King of the Jungle. “Tarzan thinks he’s the greatest thing in the jungle,” explained PaintBox founder Tom McCabe in a recent TV interview. “The truth is, he’s not, but all the older animals cut him some slack ’cause he’s nice to the little ones,” teaching them to swim, climb the trees and stay out of danger. 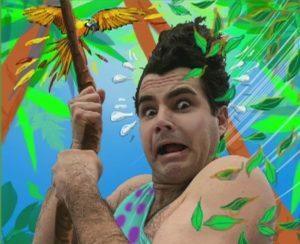 Tarzan features Troy David Mercier in the title role, Linda Tardif as the world-renowned scientist Doctor Jane, and Callum LaFrance as Cheetah the Chimp and, along with the audience, all the other animals of the jungle. Performances are Saturday and Sunday, July 7-8, at Williston School in Easthampton, and Wednesday the 11th in the Easthampton Band Shell.